For the road in Hawaii Volcanoes National Park, see Chain of Craters Road. Enki Catena is a chain of impact craters on Ganymede, caused by a fragmented space body (probably a comet). The picture covers an area about 120 miles wide. A crater chain is a line of craters along the surface of an astronomical body. 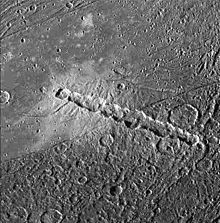 The descriptor term for crater chains is catena (plural catenae), as specified by the International Astronomical Union's rules on planetary nomenclature. Many examples of such chains are thought to have been formed by the impact of a body that was broken up by tidal forces into a string of smaller objects following roughly the same orbit. An example of such a tidally disrupted body that was observed prior to its impact on Jupiter is Comet Shoemaker-Levy 9. During the Voyager observations of the Jupiter system, planetary scientists identified 13 crater chains on Callisto and three on Ganymede (except those formed by secondary craters). Later some of these chains turned out to be secondary or tectonic features, but some other chains were discovered. As of 1996, 8 primary chains on Callisto and 3 on Ganymede were confirmed. Other cases, such as many of those on Mars, represent chains of collapse pits associated with grabens (see, for example, the Tithoniae Catenae near Tithonium Chasma). Crater chains seen on the Moon often radiate from larger craters, and in such cases are thought to be either caused by secondary impacts of the larger crater's ejecta or by volcanic venting activity along a rift. ^ "Gazetteer of Planetary Nomenclature - Descriptor Terms (Feature Types)". Retrieved 2014-10-04. ^ Melosh H. J.; Schenk P. (October 1993). "Split comets and the origin of crater chains on Ganymede and Callisto". Nature. 365 (6448): 731–733. Bibcode:1993Natur.365..731M. doi:10.1038/365731a0. ^ Schenk P. M.; Asphaug E.; McKinnon W. B.; Melosh H. J.; Weissman P. R. (June 1996). "Cometary Nuclei and Tidal Disruption: The Geologic Record of Crater Chains on Callisto and Ganymede" (PDF). Icarus. 21 (2): 249–274. Bibcode:1996Icar..121..249S. doi:10.1006/icar.1996.0084. ^ H. Masursky; G. W. Colton; F. El-Baz, eds. (1978). "Chapter 5: Craters". Apollo over the Moon: a view from orbit. NASA SP-362. NASA. Archived from the original on 2013-04-19. This page was last edited on 2 November 2017, at 00:05 (UTC).